Editor’s Note: The author discusses Sanchin kata (or exercise) as performed in Uechi-Ryu karate where the hands are kept open. 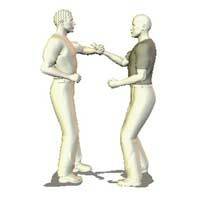 In other styles, such as Goju-ryu, the hands are closed in a fist when held in front of the body and thrust outward. A fellow once told me this, and I scoffed. After all, I had over twenty years of studying Karate, how could I not know Karate? Then I learned Sanchin, and found that he was absolutely right. Master Kanbun Uechi (1877-1948), the founder of Uechi-Ryu Karate, performing a double spear hand thrust that appears toward the end of Sanchin. Sanchin is the heart of the system known as Pan Gai Noon. Pan Gai Noon became Uechi-Ryu, and Sanchin remained the heart. And many different systems of Karate also have Sanchin in their curriculum. There is the obvious meaning of “Body, mind and soul.” One must train the body to train the mind to train the soul. There are the three elements that one should concentrate on to master Karate: speed, strength and technique. Of course if one wants to really plumb the depths of Sanchin one should consider the three basic techniques within Sanchin. Thrusting is the extension of the arms, utilizing the explosion of Tan Tien (the center of the body located just below the navel), as braced by the immoveable Hourglass Stance (known as the Sanchin Stance (where one foot is forward of the other and the feet are angled inward). 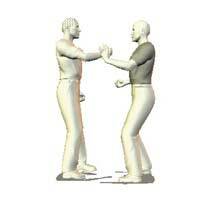 Within the Kata there are two precise examples of this thrusting motion. One is at the very beginning, and one is near the end. In the beginning example the wrists are raised to the Tan Tien level, similar to a gunfighter pulling guns out of holsters. Then the spear hands are thrust forward and down. Original time for learning this form was two to three years. It wasn’t uncommon for a student to do nothing but this downward spear thrusting for several months. The reason this opening technique was so important was because it taught the student to put ‘Gravity’ into his strike. This is to say that the downward sinking of the body didn’t even have to be emphasized to get a student to drop his weight and make his Tan Tien work. The direction of the strike increased gravity without the teacher having to say anything. I call this particular strike the ‘Leather Piercer,’ and I tell my students they must practice this until they can thrust their fingers through a piece of stretched leather. I also have them practice finger-tip push-ups, working the fingers until they are straight, and not claws. And, of course one could return to the original methods of thrusting the fingers into a vat of sand, exchanging the sand for harder materials as time goes by. The bulk of Sanchin is taken up by the action of stepping while holding the hands as if holding a thousand pound pot. One hand is then circled in, as if blocking, and then thrust outward in a spear. The technique within this motion is a simple Inward Block with the edge of the hand (chop) and then circling the hand to a thrusting spear. But most of the people that I have seen do this move execute a straight outward and straight backward motion. Thus the block is obscured and the speed and strength of the action is reduced. Within Sanchin are horizontal and vertical circle techniques which describe a mathematical “X, Y, Z” control of the space around you through basic blocks. What’s interesting is that you can combine them. They will meet any potential situation. Consider, if you thrust the hand straight out and then pull it back the only muscles that receive work are the forward and back muscles. This means that one has to start the arm forward, stop it when it reaches it’s destination, then start the arm back, and stop it when it has returned. This is two actions of start and stop. But if you circle the arm inward, and continue the circle until the arm is out thrust, there is only one cycle of start and stop. Thus there is a very real blocking motion, and it is done faster because there are less mechanical things to do, and there is more ‘Muscle,’ in addition to the forward and backward muscle, that is used. The truth of the matter is that if you do this motion as I have described it you will find that your speed increases dramatically. This is a simple concept of less hard angles and more curves. The vertical circle comes at the end of the form. This is the circular motion done with the hands open (claws) as one learns to step to the rear and then to the sides. When one enters this particular technique they should point the fingers of the hand that is going to block low in the direction of the block, then wave the hand and snap the palm bone into place. The top hand, while having potential applications, is more of a guard hand. The vertical circle of the hands occurs at this point. At the end of the circle the arms are pushed forward as if pushing something weighing a thousand pound away from you. So let’s talk about the manifestation of these three motions into actual technique. The Thrusting motion is obvious. It is a strike? Wrong. It is the Mother of all All Strikes! 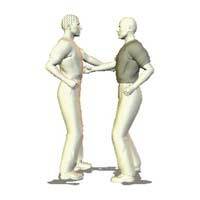 Stand facing your partner and have him execute (in even counts) a left punch to your belly, a right punch to your belly, a left punch to your forehead, and a right punch to your forehead. He should punch as hard as he can, but barely touch the skin. 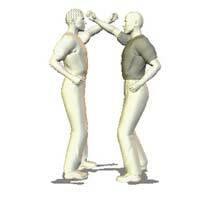 As he punches to the belly you should punch with the same side hand and “Override” his punch. 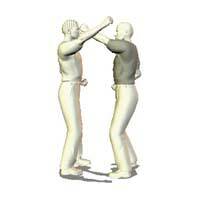 As he punches to the forehead take the inside track and, again with the same side hands, punch through his strikes. As your forearms ram across his forearms your “Intention” will grow stronger. You will become extremely strong in your punch as you learn to punch through the increased resistance of this simultaneous block and strike. The second technique is from the horizontal circle movement. When the attacker strikes to your chest simply execute a chop with the cross side hand, insert the same side hand to grab, and let the chopping arm circle in and spear to the throat. The third technique is from the vertical circle movement. When the attacker strikes to your chest simply execute a slap with the same side hand, insert the cross side hand to grab, and let the slapping arm circle to claw the side of the face. I usually place the thumb right on the side of the neck. The neck is the connector between the computer and the life support system. There are so many pressure points within this conduit of nerve pulse and oxygen and blood that it is almost impossible not to strike something. You may be surprised at how fast the attacker drops. I suggest, however, that you not apply any pressure at all to your training partner. Simply, don’t break it if you can’t fix it. 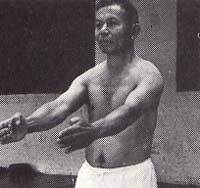 Following is the basic exercise I use to train people in Sanchin techniques. It can be altered to fit any of the concepts listed in this article, and a lot more besides. While training a person in Sanchin I tend to have them work on the three techniques for a while, then we move into combining the horizontal and vertical circles. The horizontal and vertical circles, describe a mathematical “X, Y, Z” control of the space around a person through basic blocks. What’s interesting is that you can combine them. They will meet any potential situation. I have left out the block for a kick at this early level, though one could insert it easily enough by using a palm bone block within the vertical circle. But let’s just look at the four combinations possible to you through these first two blocks. 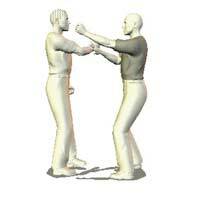 The Attacker punches with the right hand. The Defender side steps slightly to the left and forward with the left foot into an hourglass stance and executes a left palm and a right grab to the wrist. 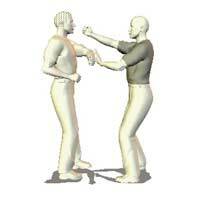 The attacker punches with the left hand. The defender side steps to the right and puts the right foot forward in an hourglass stance and executes a right palm and a left grab, and circles a right claw to the neck. Continue doing this exercise for a long time. The defender side steps slightly to the right and forward with the right foot into an hourglass stance and executes a right chop and a left grab to the wrist. The defender side steps to the left and puts the left foot forward in an hourglass stance and executes a left chop and a right grab, and circles a left spear to the neck. The defender side steps to the left further, maintaining the hourglass stance, and executes a left chop and a right grab to the wrist, and circles a left spear to the neck. 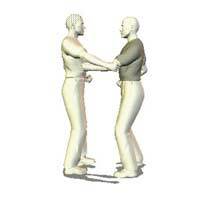 The defender side steps further to the right, maintaining an hourglass stance and executes a right palm and a left grab, and circles a right claw to the neck. In arranging the basic blocks of Sanchin in the above four combinations one has not only taken into account virtually every potential of hand strikes, but has also gained some insight as to how to close weaknesses which arise in the execution of the blocks. But the real glory in this methodology is that the instructor does not have to “Entertain” student with endless technique. When a student engages (practices) these four combinations he will rapidly find many questions answered. In one stroke he is cured from that addiction of learning increasing numbers of fancy techniques that don’t work. He is also made to understand how to search for true depth of technique, something which is obtained only through penetration of fantasy and search for what works. Al Case began his study of the martial arts in 1967. The Arts he has studied include Aikido, Shaolin, Tai Chi Chuan, Pa Kua Chang, various weapons, and more. He has written over 30 articles for the magazines, and had his own column, Case Histories, in Inside Karate. He is also a published poet, has written short stories, and published over 20 novels. He is the inventor of Matrixing technology, and his website is MonsterMartialArts.com.